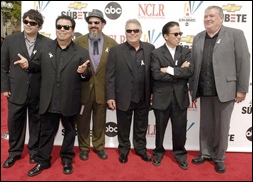 BOULDER, CO (CelebrityAccess MediaWire) — Latin rock group Los Lobos is starting their Brotherhood Tour. Hosted by Los Lonely Boys who are joined by co-headliners Los Lobos, The Brotherhood Tour will stop in cities across the United States to bring that special Latin flavor for which they are both well-known. Since they began as Los Lobos Del Este Los Angeles in 1973, Los Lobos has evolved into an artistic entity using eclectic musical molds built on the blues, rockabilly, jazz, Latin and their own Mexican-American heritage. Los Lobos has thrived for more than three decades. In that time, they have released over 15 albums, won the Best American/Mexican Grammy for Anselma in 1984, and in 1987 their cover of "La Bamba" shot straight to #1 on the Billboard Singles chart where it remained for three weeks. Opening for Los Lobos at more than half their 2008 shows are Texican trio Los Lonely Boys – brothers Henry, JoJo and Ringo Garz. They have multi-platinum album sales, and a Grammy Award for their hit "Heaven" in 2005. The Boys' third album, Forgiven, hits the streets on July 01, 2008.